Cap up to 10 cm, orange brown to brown; cap margin incurved. Stipe usually tapering towards the base, concolorous with the cap. Flesh orange, unchanging when exposed to air. 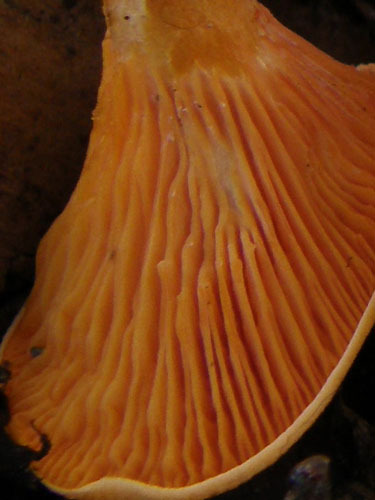 Gills orange, decurrent (running down the stipe), forked. Smell not distinctive. Taste not distinctive. Spores 5–7 × 3–4 μm, dextrinoid. Habitat. In mixed and coniferous forests, on litter or stumps, sometimes on sawdust. Distribution. Probably widespread in Europe, but its distribution needs clarification. Note. The status of H. rufa was until recently uncertain, but recent research by morphological and molecular techniques confirmed that it is a good species (see Holec & Kolařík 2013; available online). Holec & Kolařík (2013) also stress that the spore size and possibly also the spore morphology appear so far as good distinguishing characters between H. rufa (5.6–6.4 × 3.6–4.4 μm, thick-walled) and H. aurantiaca (6.4–8.0 × 4.0–5.2 μm; thin-walled), based on measurements from Czech collections. Kibby, G. 2012. The Hygrophoropsis aurantiaca complex. – Field Mycology 13: 43c50. Holec, J. & Kolařík, M. 2013. 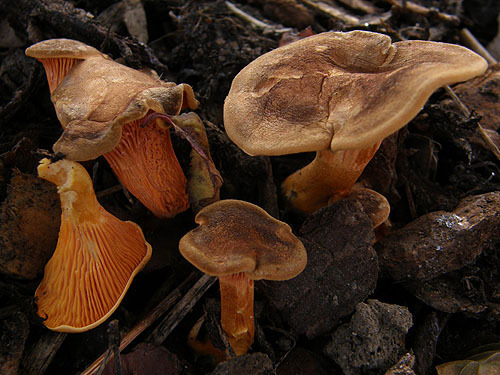 Notes on the identity of Hygrophoropsis rufa (Basidiomycota, Boletales). – Czech Mycology 65: 15-24.